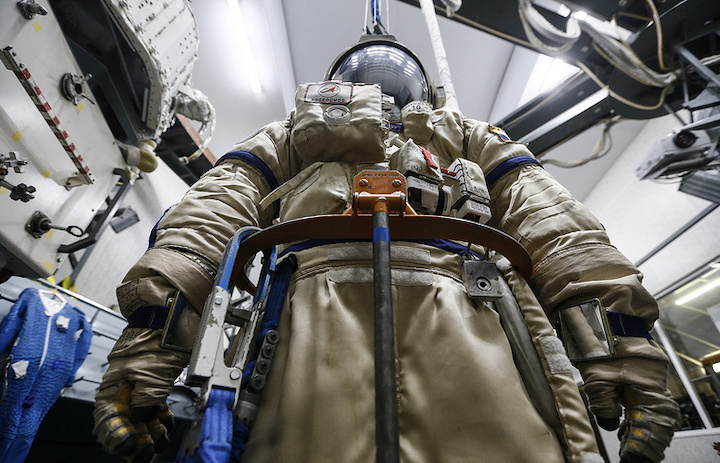 The Zvezda Research and Production Enterprise plans to start developing a new modular spacesuit for cosmonauts in 2019 after signing a corresponding contract with Russia’s Energia Space Rocket Corporation, Zvezda CEO and Chief Designer Sergei Pozdnyakov told TASS on Wednesday. "We will prepare a proposal for the new spacesuit. This year, we will surely formulate its outlook and start work. We hope that the contract will be signed this year, most likely with Energia," Pozdnyakov said. The new spacesuit will be used for spacewalks from the International Space Station and for landing on the Moon, although the outfit will require some adjustments in the latter case, he said. "The hard torso for landing on the Moon should be shortened; possibly, its entry will be altered. The torso assembly covering the legs is the most important thing as mobility should be very high. But the spacesuit’s basic concept remains the same," the chief designer explained. It will take several years to develop a new spacesuit, considering "the cycle of development and tests, he said, adding that the Company had already outlined its unofficial proposal on the project to Energia. Since 2018, Russian members of the International Space Station have been conducting spacewalks wearing Orlan suits. The spacesuit is not designed for its use on the surface of planets. The Orlan differs from its previous version by its new airtight covering made of hi-tech durable fabric, and also by the new automated water cooling system that maintains the most comfortable temperature for a cosmonaut.